In the past, we've seen ABS-CBN reporter Yong Chavez rubbing elbows with the likes of Drew Barrymore, Adam Sandler, Lou Diamond Phillips, just to name a few. This month comes another. 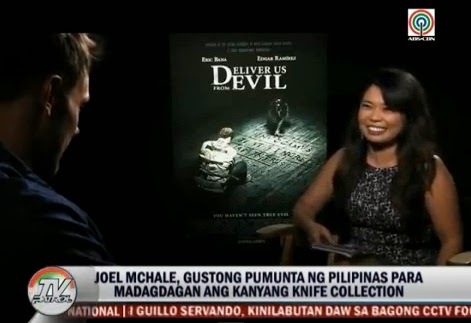 As an opener for July, Yong interviewed two of the main casts of "Deliver Us From Evil," Eric Bana and Joel McHale. The new movie which is inspired by true events, tackles the issue of exorcism. It wouldn't be a Yong Chavez interview, of course, without a reference to the Filipino culture. In the interview, Yong asked McHale about his eskrima training, which he calls "a system of murder." McHale, lead star of the now-cancelled NBC show "The Community," also expressed his desire to visit the Philippines where he is planning to buy knives as addition to his own collection. Also not to be missed is Yong's appearance on the movie's edited trailer, shot during the press junket.